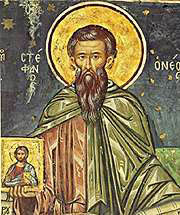 The righteous Stephen was born in Constantinople in 715 to pious parents named John and Anna. His mother had prayed often to the most holy Theotokos in her church at Blachernae to be granted a son, and one day received a revelation from our Lady that she would conceive the son she desired. When Anna had conceived, she asked the newly-elected Patriarch Germanus (see May 12) to bless the babe in her womb. He said, "May God bless him through the prayers of the holy First Martyr Stephen." At that moment Anna saw a flame of fire issue from the mouth of the holy Patriarch. When the child was born, she named him Stephen, according to the prophecy of Saint Germanus. Stephen struggled in asceticism from his youth in Bithynia at the Monastery of Saint Auxentius, which was located at a lofty place called Mount Auxentius (see Feb. 14). Because of his extreme labours and great goodness, he was chosen by the hermits of Mount Auxentius to be their leader. The fame of his spiritual struggles reached the ears of all, and the fragrance of his virtue drew many to himself. During the reign of Constantine V (741-775), Stephen showed his love of Orthodoxy in contending for the Faith. This Constantine was called Copronymus, that is, "namesake of dung," because while being baptized he had soiled the waters of regeneration, giving a fitting token of what manner of impiety he would later embrace. Besides being a fierce Iconoclast, Constantine raised up a ruthless persecution of monasticism. He held a council in 754 that anathematized the holy icons. Because Saint Stephen rejected this council, the Emperor framed false accusations against him and exiled him. But while in exile Saint Stephen performed healings with holy icons and turned many away from Iconoclasm. When he was brought before the Emperor again, he showed him a coin and asked whose image the coin bore. "Mine," said the tyrant. "If any man trample upon thine image, is he liable to punishment?" asked the Saint. When they that stood by answered yes, the Saint groaned because of their blindness, and said if they thought dishonouring the image of a corruptible king worthy of punishment, what torment would they receive who trampled upon the image of the Master Christ and of the Mother of God? Then he threw the coin to the ground and trampled on it. He was condemned to eleven months in bonds and imprisonment. Later, he was dragged over the earth and was stoned, like Stephen the First Martyr; wherefore he is called Stephen the New. Finally, he was struck with a wooden club on the temple and his head was shattered, and thus he gave up his spirit in the year 767. With songs and hymns, O ye feast-lovers, let us all extol the godly Stephen, that great lover of the Trinity, for he honoured with his whole heart the comely image of the Master, of His Mother, and of all the Saints. Now with one accord, with longing, and with joy of heart, let us cry to him: Rejoice, O Father most glorious. Share the feast of Stephen the New with an icon greeting ecard.